It's a really fun mini-field trip to go to an apple orchard to pick your own apples, and save one for this craft. Actually, it's fun to EAT half of that apple, and use the other half to make this cute card! Fold red paper in half, like a greeting card. Fold a slightly smaller piece of white paper (you may have to cut it with scissors) and glue it on top of the red paper, so that the red becomes like a "frame" around the outer edges of the white. The inside of the card will be red. Cut the apple in half. Pick out three apple seeds. Dry with a bit of paper towel. Pour red paint into a pie tin or other shallow container. 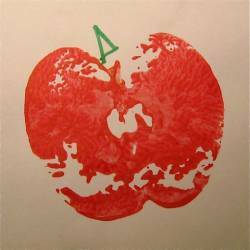 Stamp the flat end of the apple half in paint, and then on the white paper, so that the center of the apple half is on top of the seeds. Glue apple seeds to the middle of the apple stamp, in a trio arrangement. With green paint and a brush, add leaves. Add a caterpillar with segments made of little fingerprints, using green paint. When the paint dries, use a thin black Sharpie marker to add eyes and an antenna. You are the apple of my eye! Don't forget to sign your name! This makes a great birthday card for a parent, grandparent, friend, teacher or anyone else who's special.